The black high-quality 9ft. 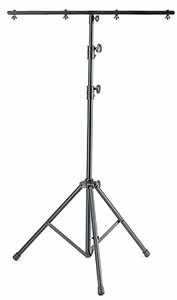 black aluminum/steel constructed tripod features and extensible height and T-bar. Single T-bar with support bars and hanging bolts. Highly recommended for pin sports and par cans.